Many people comprise our Freepik Universe, forming a great unique team. They are creative, passionate, a bit geeky, and they love pizza, foosball and after-work gatherings. Work is not everything. Our schedule is semi-flexible, allowing you to combine work with personal life and giving you more freedom. We like to grow together, and that’s why we encourage professional training. Our workers’ knowledge and skills add value to our company. We make it easier for you to attend courses, congresses, conferences and get your master’s degrees. Like we say in Spain, “Hunger is a bad advisor”, so we have a good variety of ways to fight it off. A little mid-morning snack can help you get your energy back. Good vibes and cooperation are essential for our Universe. That’s why we organize events and team building activities all year round. 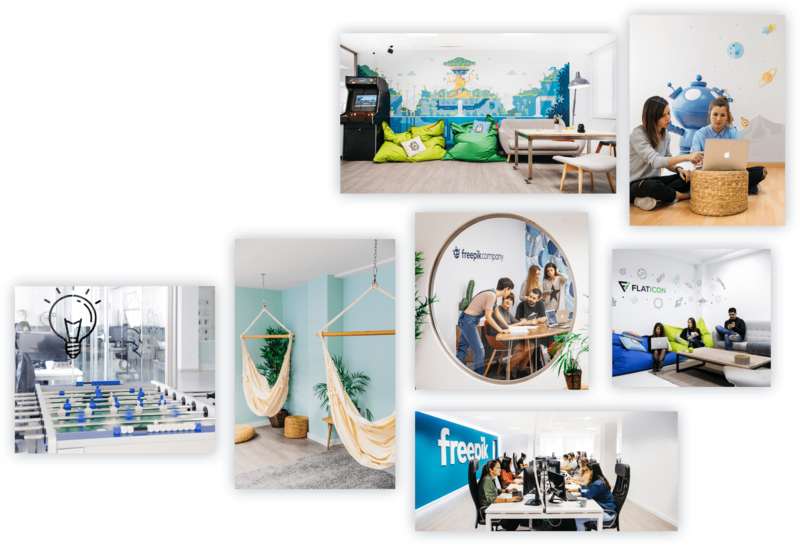 Freepik Company’s office is located in downtown Málaga, a charming city with one of the best climates in Europe. Our modern facilities allow maximum comfort at work. Plenty of space, meeting rooms, leisure areas and everything needed to work in a great environment.